Last week we were delighted to receive an email from Dr. Christoph Egger of the Institut für Österreichische Geschichtsforschung about Ms. Codex 615, a fourteenth-century manuscript from Bohemia of Alain de Lille’s De planctu naturae. Penn purchased this manuscript from Philadelphia bookdealer William H. Allen in 1951, but we knew nothing about its journeys before that. Thanks to our digital facsimile available online, Dr. Egger identified Ms. Codex 615 as formerly MS 478 in the library of Stift Admont, the Benedictine monastery in the town of Admont, in central Austria. The monastery’s library still owns more than 1,400 manuscripts. Our manuscript has the Admont shelfmark on a label on its spine, shown here, and is described in a catalog of the monastery’s manuscripts, itself a manuscript compiled by Jakob Wichner in 1888, which is also fully available online thanks to manuscripta.at. The entry for MS 478 has a note added in pencil recording the sale of this manuscript in 1938 to Brecher, who, according to Dr. Egger, was an antiquarian bookdealer in Brno. For the source of this excellent information, details on more manuscripts from Admont now in other libraries, and a reunion of Ms. Codex 615 with some of its old friends, please see Dr. Egger’s post, “olim Admont,” on the Iter Austriacum blog. Categories: Manuscript Research, Medieval | Tags: manuscripts, MsCodex615, Provenance | Permalink. We’re looking forward to the fourth annual offering of the SIMS manuscript skills summer course! Aimed at graduate students in medieval and Renaissance studies who want to use manuscripts in their research, the course gives students a hands-on introduction to handling, reading, and studying European manuscripts up to the 16th century, as well as to digital humanities projects built on manuscript images. Students are paired with manuscripts from the Penn collection in their areas of interest to give them an opportunity to apply the content of the course and become the local experts in “their” manuscripts. The class sessions, which run from 10 am to noon on Tuesdays, Wednesdays, and Thursdays from May 22 to June 27, include lectures, exercises, and time for independent study of students’ manuscripts. 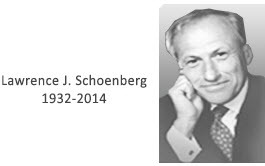 The course is free, not for credit, and open to graduate students from any institution. Penn students may register through the Graduate Division of Arts and Sciences here through March 29; students from other institutions should send an email about interest, languages, and paleography experience to Amey Hutchins (ameyh@upenn.edu). Categories: Announcement, Medieval | Tags: manuscripts, SIMS | Permalink. Dr. Emily Steiner, Professor of English at the University of Pennsylvania and Amey Hutchins, Manuscripts Cataloger in the Kislak Center for Special Collections, Rare Books, and Manuscripts, discuss University of Pennsylvania’s LJS 266, a collection of genealogical and chronicle material. The codex includes Biblical genealogy from Adam to Jesus and the apostles; genealogy concerning the Trojan War and the founding of Rome; the legendary history of England and France as founded by descendants of participants in the Trojan War, including the genealogy of Brut and the succeeding line of kings in England up to Coyl; the emperors of Rome; the Holy Emperors starting with Charlemagne; and the kings of France up to Charles V (crowned 1364). 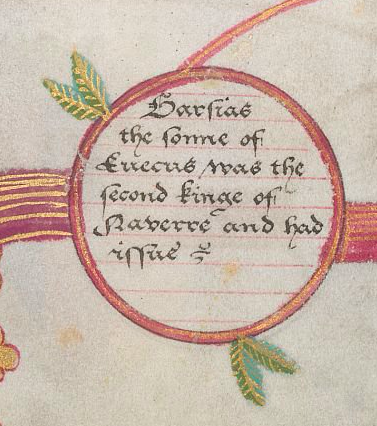 The introduction (f. 1r) suggests that the manuscript was meant to trace the kings of England through Richard II (1377-1399) and the popes through one named Innocent and therefore that the manuscript is incomplete. 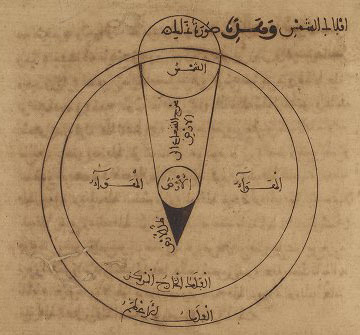 A digital facsimile of this manuscript is available at http://hdl.library.upenn.edu/1017/d/medren/4952511. (Below) Dr. Emily Steiner presenting LJS 266 at the Delaware Valley Medieval Association Meeting, September 21, 2013, at the Kislak Special Collections Center for Rare Books and Manuscripts of the University of Pennsylvania Library. Categories: Medieval, Video | Tags: LJS266 | Permalink. At this moment the Penn Libraries are embarking on a search for a senior conservator and eagerly anticipating the September opening of a new, 3,500-square-foot conservation lab in the Kislak Center for Special Collections, Rare Books and Manuscripts. It’s a good time for a story about what conservation can do. For some students, a 600-year-old manuscript works its magic on their imagination and curiosity even if they can’t read what’s written on its pages. But, not surprisingly, being able to make out even a few lines of text takes students to another level, slowing them down to experience script and page layout for themselves. So opportunities to read open up more pedagogical possibilities for faculty. Students with skills in Latin or Italian have an abundance of choices among the manuscripts of the Kislak Center. Students with skills in French or German have a respectable array from which to choose. But for students whose needs would be best met by early English manuscripts, we have only a precious handful — five manuscripts. Middle English manuscripts are now extremely difficult to acquire, and we are fortunate to have these five manuscripts from acquisitions of the 1940s and early 1950s. But they had hard lives before coming to the library, all but one having been rebound by owners of past centuries, often trimmed to fit into not particularly durable new bindings, and at the library the manuscripts continue to work hard for students, faculty, and library staff. Categories: Manuscript Research, Medieval | Tags: Conservation, Ms. Codex 197 | Permalink. Who wrote Penn MS Codex 1070? Megan Cook, an Assistant Professor of English at Colby College, spent a week in July at the Schoenberg Institute for Manuscript Studies as one of the students in The Medieval Manuscript in the Twenty-First Century, a course under the auspices of Rare Book School, headquartered at the University of Virginia. Here she shares her experience of that week, working with Penn Ms. Codex 1070. Although it might be considered cheating, given the theme of the course, during my week as a student in Will Noel and Dot Porter’s Rare Book School class, the Medieval Manuscript in the Twenty-first Century, I spent most of my time working on a sixteenth-century heraldic manuscript. While Penn Ms. Codex 1070, isn’t medieval, my experiences with it show how open access to digital images of early books can facilitate new answers to old questions. 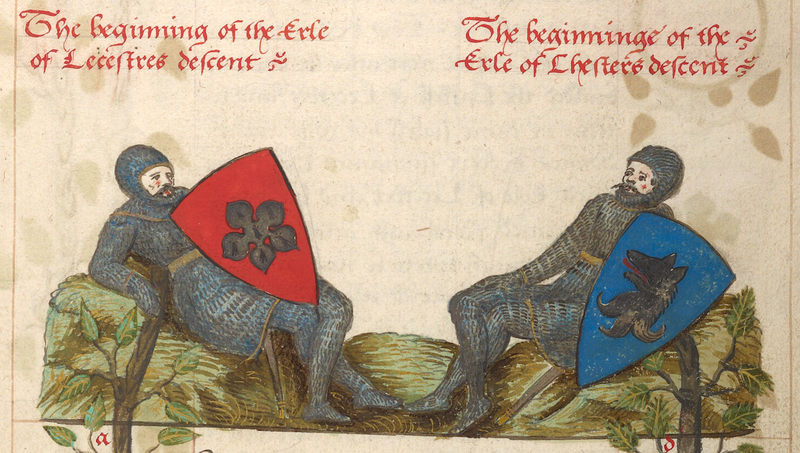 The Genelogies of the Erles of Lecestre & Chester wherein is briefly shewed som part of their deedes and actes with the tyme of their raignes in their Erldoms, and in what order the saide Erldoms did rightfully descend to the crowne, and in the same is also conteyned a lineall descent shewing how the right honorable Robert Erle Lecestre and Baron of Denbigh knight of [th]e Garter and Chamberlen of Chester is trewly descended of Margaret second sister and one of the heires of Robert fitz Pernell the first Erle of Lecestre and of Maude and Agnes the first and third doughters to hugh keuelock the fifte Erle of Chester, sisters and coheirs to Randolf Blondeuile the sixt Erle of Chester. 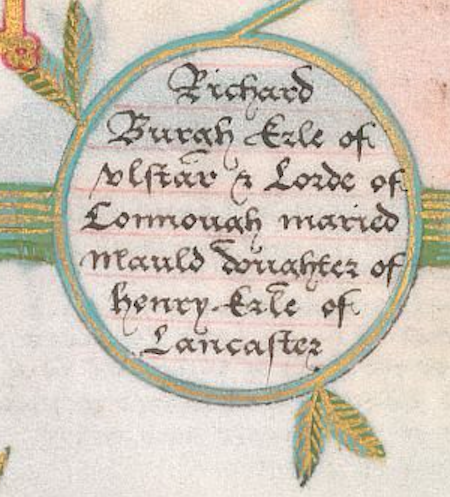 Note that the lynes and descent[es] come from those rondells in the margent which be stayed by two leaues, and the other rondells that are stayed but by one leafe are the colaterall children. 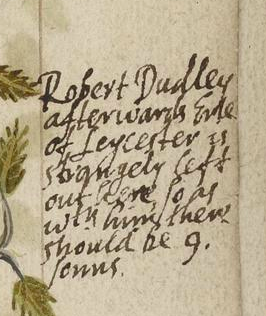 This passage tells us that the book describes the ancestry of Robert Dudley (1532-1588), the first Earl of Leicester. It was created in 1571 or 1572, perhaps in honor of Dudley’s appointment to the Order of the Garter in that year. 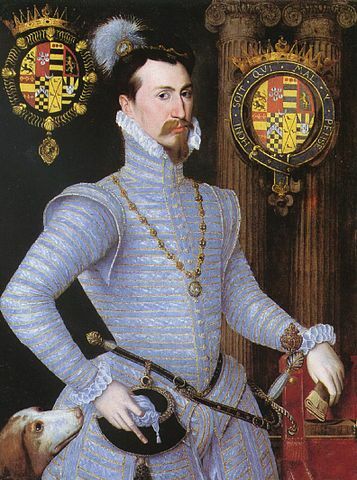 Dudley was a favorite of Elizabeth’s and, although he was no longer a contender for Elizabeth’s hand by the 1570s, he remained an important political figure until the end of his life. 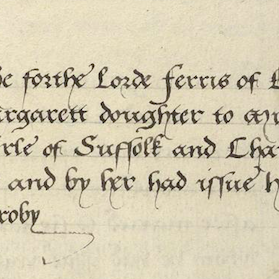 While the book is a fine production, it contains several factual errors, and Robert Dudley himself does not appear in the genealogy alongside his siblings—a strange error that was noted by one later reader. 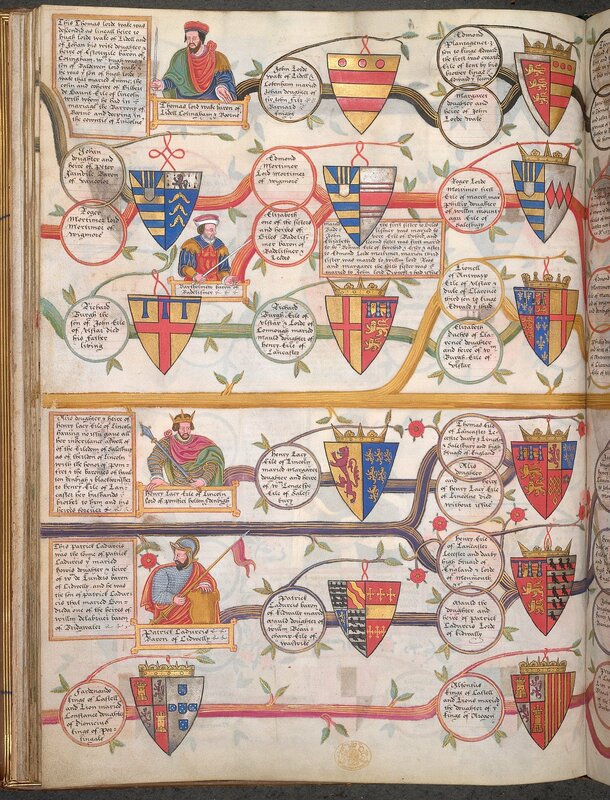 Deluxe heraldic manuscripts like this were a way for families and individuals to both assert and display their pedigree by documenting the complex maneuvers by which titles (and the land and wealth associated them) were transferred over the generations through inheritance and marriage. 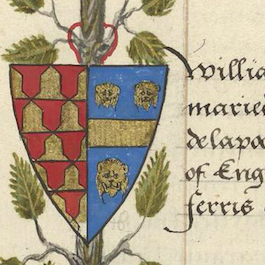 Genealogy was just one way of using heraldry (the collection and display of coats of arms): the 2014 Folger Shakespeare Library exhibit Symbols of Honor explores the range of contexts and uses for heraldic display in early modern England. After looking through Penn MS Codex 1070 and admiring its elegant design and naturalistic depiction of the eleventh century earls (complete with period-appropriate armor), I wondered: who created this book? 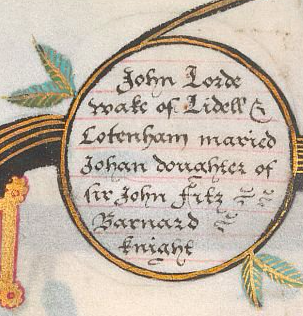 A production like MS Codex 1070 would require a combination of artistic skill and access to the historical sources necessary to trace five centuries of Leicester ancestors. 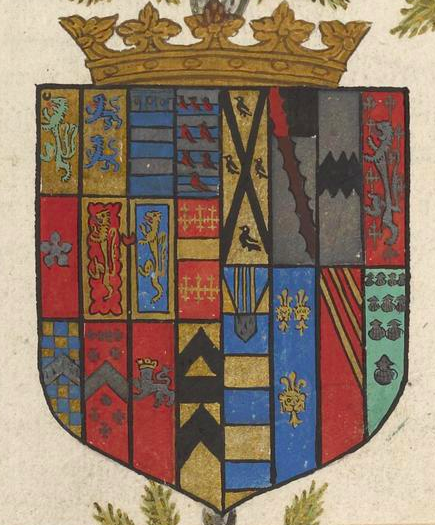 There were only so many people living in England in the 1570s with the requisite background; many would have been professional heralds associated with the College of Arms who, in addition to researching and adjudicating official grants of titles, undertook deluxe manuscript productions for wealthy patrons. Penn Codex 1070 tells us nothing about who made it, or to whom it was originally presented, but it is clearly is a professional production, not the work of an amateur. Flipping through its pages (see for yourself here), it is easy to appreciate how much careful planning the manuscript would have required: whoever created the manuscript had to arrange his pages so that there was sufficient room for both the text and the accompanying roundels. The roundels needed to be appropriately sized for the text they contain, but also leave room for the carefully detailed shields and the branches that link them. At certain points, branches merge with, or diverge from, one another, and getting this right would have required special attention when the pages were laid out. Codex 1070 is unusual in that the branches extend all the way into the upper and lower margins, creating them impression of vertical continuity from page to page. By doing so, I think whoever created the manuscript meant to take a well-established format for displaying genealogical information—the armorial roll, or scroll (see, for example, Penn MS 1066)—and adapt it to the codex format, which would have allowed for easier reading, storage, and transportation. The image below shows how the maker of this book worked in stages, assembling each page in layers: First, he ruled the page using plumb line; then he wrote the text. Next, he added illustrative details, including the naturalistic branches and leaves, and the more formalized depictions of coats of arms. Finally, he added decorative red lining around the margins. I wanted to see if I could test McGeogh’s hypotheses by looking for manuscripts created by Cooke, Cocke, and Knight and determining whether they looked anything like the Penn manuscript. I began by looking at digital images from archives that I knew held heraldic manuscripts, including the Folger Shakespeare Library and the British Library. Neither contained any materials associated with John Cocke or Edmund Knight. 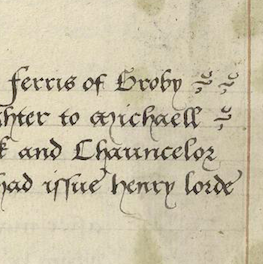 At the Folger Shakespeare Library, I found Folger MS V.b.76. 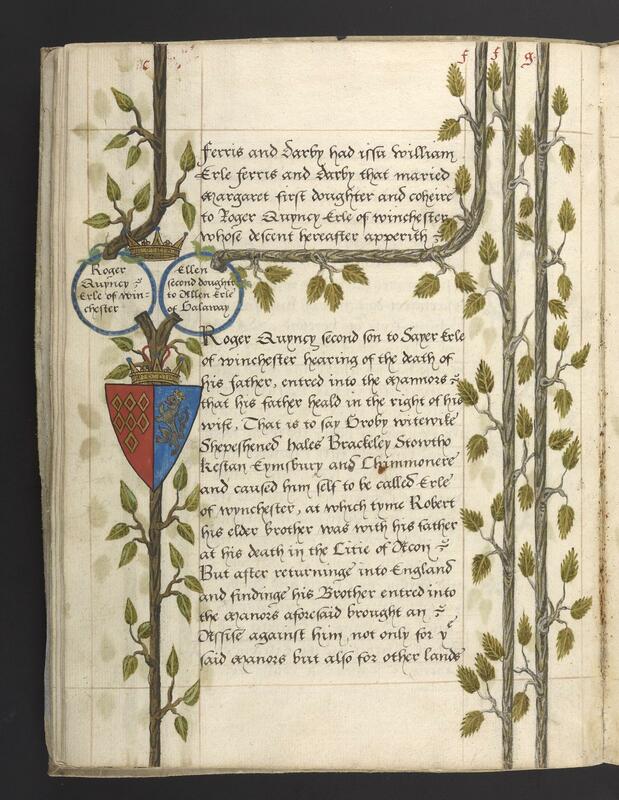 This is a copy of a text written by Robert Cooke, but the hand doesn’t match the one in the Penn manuscript. It is not an autograph manuscript. At the British Library, however, I found several images from MS King’s 396, a genealogy of Queen Elizabeth I on vellum, created around 1567. Like the book at Penn, this manuscript doesn’t explicitly say anything about the people involved in its production. But a comparison of some key features across the books leads me to conclude that both were made and illustrated by the same person or persons. We can also see the similarity in the appearance of the leaves. And even in the line fillers that the scribe uses to use up extra space. Since they are housed in archives on opposite sides of the Atlantic, it is unlikely that I will ever get to Penn MS Codex 1070 and British Library MS King’s 396 side-by-side. Nonetheless, thanks to the British Library’s recent decision to make thousands images of their holdings freely available online, I was able to perform research from my desk in Philadelphia that affirms the hypothesis offered up by Barbara McGeogh more than forty years ago. An even larger archive of heraldic images, including the ones mentioned in the British Library catalogue and held at the Bodleian, might have allowed for an even more concrete answer. This exercise shows that quite a lot might be learned from even a simple comparison that might never have been possible without digital images. 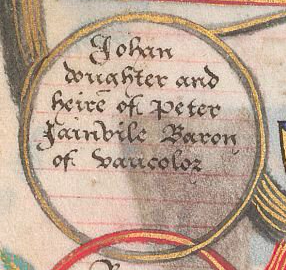 The power of visual comparison on a larger scale is demonstrated in projects like Late Medieval English Scribes, which allows users to compare samples of all scribal hands that appear in the manuscripts of major Middle English authors and, in so doing, to produce new knowledge about the circulation of vernacular texts in late medieval England. 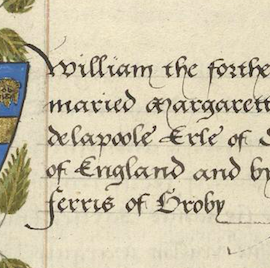 A larger database of images from heraldic manuscripts might, similarly, offer new insight into the development, usage, and propagation of a highly codified system of genealogy and heraldry in the sixteenth century and beyond. Categories: Manuscript Research, Medieval | Tags: RBS | Permalink.